Scanning a tree is a straightforward process at the site. For trunk scans, several elevations designated for measurement are marked on the tree. The handheld transceiver of the TRU is moved around the tree at these markers as the equipment sends pulses into the trunk and records all signals reflected from the interior. To scan root masses, the transceiver is placed at the ground level on a small cart and moved around the tree as the TRU records data. Depending on the size of the tree, and setup time at the site, visits can take from one to several hours to record all data. The data collected by the TRU is processed by highly skilled signal analysts using a proprietary software package specifically designed for the unit. The information is then translated into a graphic interpretation. 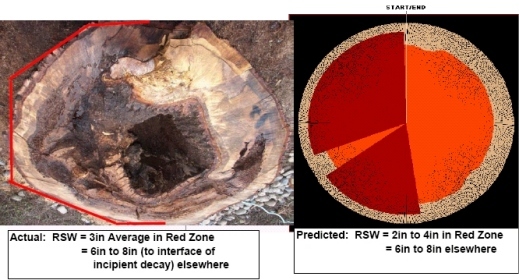 In the case of a trunk scan, each graphic represents a cross section of an elevation scanned, showing the amount of sound wood & the amount and location of decay. As the example shows, scan results faithfully depict density & decay when compared to the actual trunk. In the case of a root scan, the location of roots under the scanned area is plotted. Seen to the right is one of the possible resulting plots, a 'Virtual Excavation' or top-down image of subsurface structural root layout and density at one depth; in effect a visual 'slice' of the root mass parallel to the surface. Several depths may be plotted, down to the TRU penetration depth of 1 meter. A 'Virtual Trench' plot is also possible, to show what would be seen at the various depths of a straight trench if it were dug through the root mass. A report accompanying the plot(s) is written by the staff at Tree Radar Inc. This includes a summary of the results found during the analysis of the collected data. Dynamic Tree Systems then uses the above information as a tool to prepare a formal tree risk report. This will include the vital information needed to tie the technical information in the TRU report to an arboricultural recommendation. Through the above process our customers can rest assured that their decisions will be based on a thorough examination of the tree. With this knowledge, wise decisions can be made with valuable documentation as justification.